As a 1:1 lossless audio grabber, AudFree Mac Audio Capture is the most easy-to-use audio recorder with the ability to capture any sound playing through all Mac apps, including Safari, Chrome, iTunes, QT, VLC and other local or web media players. It's the best solution to record streaming music like Spotify, Pandora, Apple Music, YouTube, and live broadcasts, game music, online radios, and more with lossless quality and ID3 tags retained. RecordPad Sound Recorder Free for Mac has made recording easier than ever. With RecordPad, you can quickly and easily record audio notes, messages, or announcements. Find and play recordings by format, date, duration, or size. RecordPad Sound Recorder Free for Mac is designed to be simple and user-friendly. 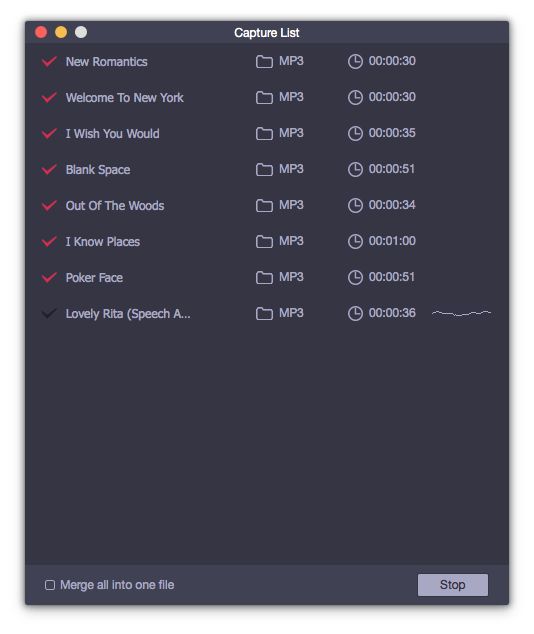 As a 1:1 lossless audio recorder, TunesKit Mac Audio Capture is the easiest audio recording tool to grab any sound track playing through all apps on Mac OSX, including Safari, Chrome, iTunes, VLC, and other local or web players. It supports capturing all kinds of audios, such as Spotify, Pandora, Apple Music, YouTube, and other streaming music, as well as live broadcasts, game music, movies, etc. with original quality and ID3 tags kept. VinylStudio makes it easy to convert your records and tapes to CD, MP3, AAC and other formats. It provides all the tools you need, including a full set of sound cleaning filters. You can record your albums, remove clicks, hiss, hum and rumble, split recordings into tracks, burn CDs and copy tracks to your MP3 player or iPod - all in one convenient, easy to use package. VinylStudio also integrates with the iTunes Music Library.